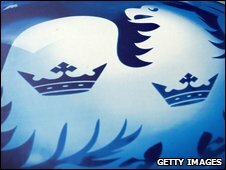 Barclays bank has had its credit rating downgraded by agency Moody's, which said it expected "significant further losses" on credit-related write-downs. The news hit shares in the company, which ended Monday trading down 11% or 11.20 pence to 94.90p. Alex Potter, an analyst at Collins Stewart investment bankers, said the downgrade was weighing on the share price "a little bit". The share fall comes after a rally in Barclays' price last week. Moody's cut the bank's financial strength rating to C from B and cut the long-term debt rating to Aa3 from Aa1. "The downgrades reflect Moody's expectation of potentially significant further losses at Barclays as a result of write-downs on credit market exposures as well as an increase in impairments in the UK, which could weaken profitability and capital ratios," Moody's said in a statement. "Although Barclays has not taken any government capital to date, Moody's considers the systemic importance of the bank and the likelihood of receiving government support in case of need to be high." The shares fall put the brakes on a rally that had seen Barclays' stock more than double in value in the past week. The rebound came after Barclays issued a statement last week saying that it was well funded, and that it would not be seeking any financial support from the UK government. In a joint letter, chairman Marcus Agius and chief executive John Varley had said the bank would report a 2008 profit "well ahead" of market targets. They said annual profit would be higher than £5.3bn, despite £8bn of gross write-downs at its investment bank. Before last week's rally, Barclays - like most banks - had seen its shares fall heavily recently, and at one stage in January its shares were trading below 50 pence. Meanwhile, Barclays has completed the acquisition of PT Bank Akita, which was announced initially in September, following the approval of the Central Bank of Indonesia. Akita will form part of Barclays' global retail and commercial banking emerging markets business. Barclays says it intends to rebrand Akita as Barclays Bank Indonesia, "at an appropriate date", subject to the necessary regulatory approvals. "The acquisition of Akita is an excellent fit with Barclays strategy of increasing its presence, over time, in emerging markets with good growth characteristics," the bank said.